Still image from gameplay footage. In 1999, Superman: The New Adventures was released on the Nintendo 64 by Titus Software, a now-defunct French-based studio. Also known as, Superman 64, it was met with an overwhelmingly negative reception for buggy controls, bad graphics, and terrible gameplay. Soon after its release, Titus commissioned BlueSky Software to commence work on a PlayStation port of the N64 game'. However, since the PlayStation couldn't handle the free-roaming Metropolis of the original, BlueSky had to re-create the game from scratch. The development of this PlayStation version had progressed far enough that magazine ads were published, pre-ordering made available, and the game was being officially licensed by Sony Computer Entertainment America. 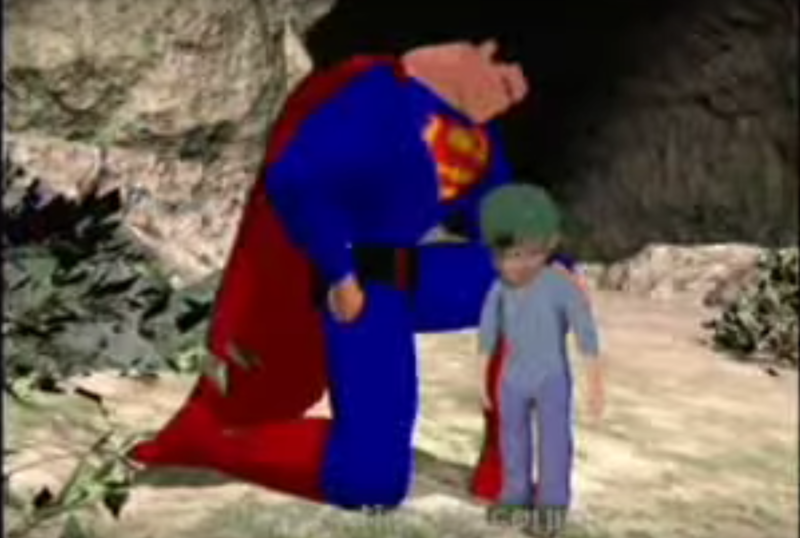 However, BlueSky lost rights to the Superman franchise, forcing them to cancel the game in order to avoid copyright issues. Since its cancellation, glimpses of the game had been seen out in the wild on several occasions. The first being a prototype recovered by the PlayStation Museum, who released two seven-minute clips in 2007 and 2011. Another had been seen at a game prototype enthusiast forum ASSEMbler Games on January 14, 2014. An ASSEMbler Games forum-goer had provided an intimate look into the prototype's internal files, including the SLUS code, with the condition to release it for a certain amount of cash. The resulting tension between the owner and the community of the former's behavior drove him to supposedly break the disc and erase the backup ISO he had, eliminating the chance of a possible rip of the game. In summer of that year, a forum-goer at the same forum provided unique footage of a prototype version of the game dated June 22, 2000. On that same thread, another member disclosed that he had possession of that same prototype but misplaced it. On October 7th, 2018, user dizzzy uploaded one of the prototype betas of the PlayStation port onto Archive.org. The newly found beta dates back to October 29th, 1999, and contains 9 levels, up to the "Brainiac" level. PlayStation Museum's video on the PlayStation port. Part 1 of gameplay footage. Part 2 of gameplay footage. Part 3 of gameplay footage. ↑ An Assemblergames forum thread about the newly released footage. ↑ Page 2 from the Assemblergames forum thread about the newly released footage. ↑ The Archive.org download link to the beta prototype of the game.